This 1967 clip from Pyotr Ilyich Tchaikovsky’s Swan Lake, legends Rudolf Nureyev and Margot Fonteyn give a very brief glimpse of the incredible athleticism involved in ballet. So. Many. Spins. 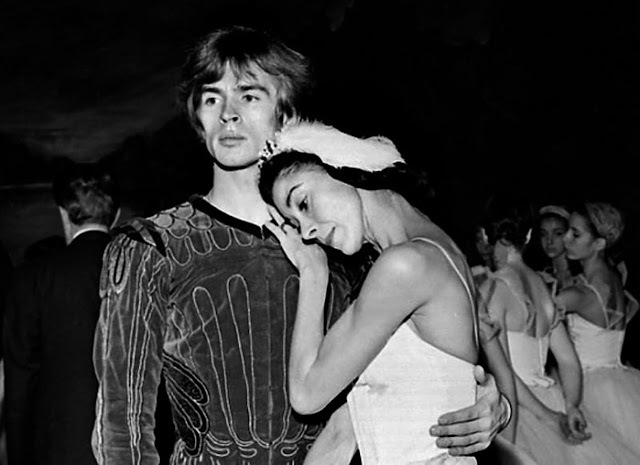 In 1961, Nureyev was invited to make his London debut at the annual gala organised by Margot Fonteyn for the Royal Academy of Dancing. He asked to dance Spectre de la Rose with her but she was already committed to do this with John Gilpin, and anyway was not sure how well she and “this young Russian” would suit each other. Nureyev therefore danced Black Swan with Hightower and a solo, Poème tragique, made for him by Frederick Ashton. The gala led the Royal Ballet to invite him to dance Giselle with Fonteyn the next season, also Swan Lake, the Don Quixote pas de deux, Les Sylphides and Sleeping Beauty with guest ballerinas Sonia Arova and Yvette Chauviré. Between whiles, Nureyev also danced with Bruhn, Arova and Hightower in Cannes and Paris, performing pieces created or staged by the two men, and he made his New York debut on television (substituting for the injured Bruhn in Bournonville’s Flower Festival at Genzano duet with Tallchief), then on stage with Ruth Page's Chicago Opera Ballet. Thus was laid the groundwork for his subsequent career: a lasting link with the Royal Ballet, frequent appearances with other companies, the beginning of his activities as producer and choreographer, and perhaps above all his partnership with Fonteyn. Both of them danced with many other partners who almost always looked better in consequence, but they were most proud of what they achieved together. He at 23 gave her at 42 a new burst of energy and understanding; she inspired him and helped him settle down. People were so eager to see them together that their agent charged far more for them as a pair than the sum of their already high individual fees. They remained lifelong close friends too.